Doesn’t it always seem to ring true that you don’t know what you have until its gone? For years I have been spoiled with certain simple luxuries in the kitchen, but got to thinking – these little extras don’t always come standard. What would I ever do without them? Here are a few kitchen stars we may take for granted, who to thank for their existence, and why they come in handy. We can thank John W. Hammes for his invention of the garbage disposal in 1927. He is said to have invented it for his wife. Without this invention, we would be left picking small food scraps out of the germy drain. 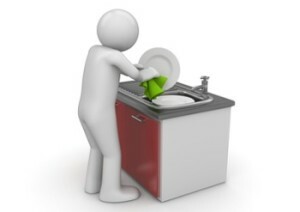 There were many people involved in the creation of the dishwasher we know and love today. We can thank Joel Houghton and L.A. Alexander for their patented inventions of the hand crank dishwashers in 1850 and 1865. However, in 1886, Josaphine Cochrane designed the first motorized version. She then began her own company, which is now known as KitchenAid. Then, in 1937, William Howard Livens invented the first dishwasher for home-use. Dishwashers save us countless hours of work, not to mention prune fingers. According to Wikipedia, the first ice machine patent was awarded to John Gorrie in 1851. In 1853, Alexander Twining received a US patent for the first ice machine, and James Harrison of Australia received a patent in 1855. Without them, we would be forced to fill those little freezer trays with water, or to haul bagged ice back from the store. A few other designs that make kitchen life easier are kitchen cabinet roll-out-trays, ventilation hoods, overhead lighting, and the spray faucet. If you don’t have any of the aforementioned, you should definitely make sure to include them in your upcoming remodel. These are little things that make a big difference.